Cole Sprouse has joined the CW’s Archie pilot, Riverdale — and no, diehard Suite Life of Zack & Cody fans, this won’t be an “Olsen twins in Full House” situation. 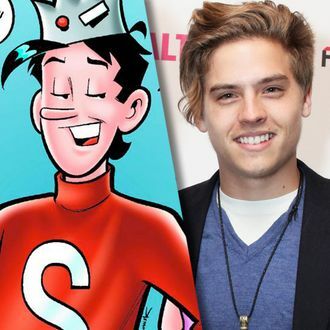 Cole, and Cole alone (sorry, Dylan), will play Jughead in the pilot, which comes from superproducer Greg Berlanti, of Flash, Arrow, and Supergirl fame. Riverdale has also cast Lili Reinhart (Fox’s short-lived Surviving Jack) as Betty, while the roles of Archie and Veronica are still up for grabs. The Archie comics just revealed that Jughead is asexual, but did the CW get the memo? Apparently not! The pilot will present a “subversive” take on the idyllic town of Riverdale, with Jughead as a “heartthrob with a philosophical bent” who has just gotten into a big fight with Archie. This could be Cody Martin’s Vanessa Hudgens in Spring Breakers moment. Congrats, if that was something you wanted.